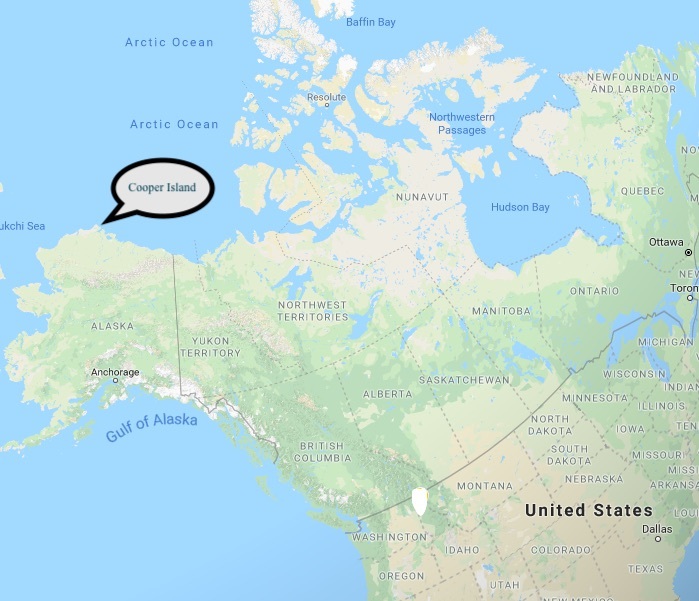 Cooper Island lies 24 miles east of the town of Utqiagvik, formerly called Barrow. I buried myself in books the last few days. The wind has been fierce, increasing through the day yesterday and last night. It was difficult to measure and weigh chicks today for the strength of the wind. A number tried to escape, half taking flight in the wind and hiding in other sites until I retrieved them. I expect a few will go tonight despite the wind – it didn’t seem that a single adult was in the colony today. I didn’t see any during my checks and not any through the day. The wind hasn’t let up at all. George is in Barrow. The batteries are all dead, and I’ve had trouble with the radio because of it. There was enough power this morning for about two minutes of radio time. For whatever reason, all four batteries seem to have met their demise. One is continuously hooked to the charger; the others are drained, but that seems odd. In any case, I’ve reconnected them to charge, and if they hold enough from today’s minuscule amount of sun, I may be able to talk with them tomorrow. George will be, water-dependent, taking a bunch of kids to Crescent Island and Plover Point tomorrow and, in theory, coming out here on Wednesday. Dave can’t boat in this weather; if it holds, I may be here a while. I was a fool to think otherwise. I’ve been holding myself to five days. In my mind, I still have five days, will continue to have five more days on the island until I actually set foot in Barrow again. It might save me. I’ve done almost nothing but the brief nest checks and read for four or five days. I finished Stones from the River today and dove straight into Love in the Time of Cholera. It is too cold and the wind too fierce for anything else; I am tired and happy to sit. I long for a hot a shower and a sauna. Relief from being cold all the time would be welcome. I bathed my feet this afternoon and discovered two substantial bruises on my toe – the big broken one. I have no clue how I got bruises on my toe. It bothered me for several days, but it never occurred to me that I bruised it. My feet are tender and were so cold this afternoon that they were painful. My toes are also rotting in the way of feet without warm, dry socks and regular washing. As my feet perspire in my boots, my socks and then the liners get damp, so my feet are perpetually wet and cold. I take the liners out every chance and all night but they never really dry. Alas. Five more days. The infernal, intolerable, eternal wind. As I suspected, the few days of calm last week have been utterly routed and supplanted by wind and the uncertainty of departure. I fantasized about the search and rescue helicopter coming to save me again. Dave said the winds were 30 mph and would increase to 40. The batteries are still not charging, so there was little conversation today. The afternoon was sunny and with no clouds, so perhaps the battery will charge enough for a real bit of talk tomorrow. My return ticket to Fairbanks is for tomorrow morning. There were hundreds of glaucous gulls today, a few terns and red phalaropes all fighting and feeding in the wind. The wind was nasty, and I hope it dies down tomorrow. In one way, there’s no obligation to do anything but nest checks and then eat and read. On the other hand, being out is so unbearable it’s not worth the reading and eating. I suspect it will be days before a boat can get out here and I’m not likely to be going back on it given George’s desire to debrief. I’ve almost finished Love in the Time of Cholera, though I only started it yesterday. There’s not much else to do really. The wind seems to have picked up again, and I’ve given in to the fact of its existence. I hold on to my five days. By radio call on 30 August, the wind had sufficiently died, though it kept me awake most of the night by smacking me in the head with the tent pole. The fog was thick but the air was clearing and George and Dave were talking about a trip out. At 1315 Dave told me the boat was gassed and ready to go. Within 15 minutes, the fog cleared, the sky was blue, the sun strong, and the wind at my back. Wow. I hauled all the stuff to the sardine box and sat to wait. I was not expecting the water to be so calm and so boatable that quickly after so much wind. It didn’t seem possible that I would be Barrow-bound like that, but there I was all packed up and waiting for the final trip. It was good to see those two – goofy as they are. I helped George move his stuff to camp and we grabbed and took whatever else he wouldn’t need. I figured the birds were going fast and he wouldn’t need to stay for very long – (as it turned out 15 fledged the next day and another five after that so by today there were only a couple left). Dave and I made a slow trip in, leading another boat that was low on fuel. The wind was behind us, the sun warm and I was happy. Yesterday was spent in a frenetic race to pack and go. I sent three boxes of books and two boxes with vertebrae. I went off to the recreation center and took a SAUNA. It was great. I scrubbed and scraped and scratched all sorts of layers of grub off me and tried to soak out all the sand and grit and dirt and cold. This morning, I wandered down to see Dave and say goodbye – it was his birthday. We radioed George, who was in his usual radio form. Then, into the air. I could see Cooper Island after takeoff – it was clear, the whole outline, south spit and all of the lakes/ponds along the south shore. My last look.